We had so much fun on Halloween this year. Some friends came over to join us trick or treating around the neighborhood. "The Greatest Showman" was a huge hit at our house this year. I saw it 4 times in the theater and took the kids once. Then we bought it and watched it nonstop for several months. I'm still singing "A Million Dreams" to Theo every night before he goes to bed. 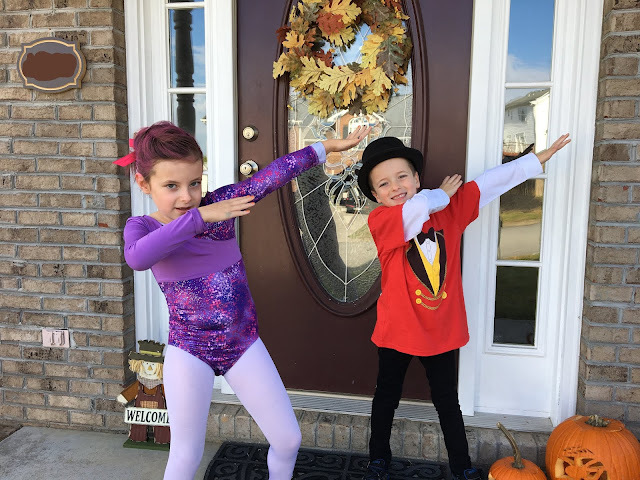 Madelyn dressed up as Anne, the trapeze girl, and Theo as PT Barnum. Our friends the Hill's joined in on the fun. Sweet Emersen was Dorothy from "The Wizard of Oz". The kids school had another fun run this year to raise money for some equipment. Thanks for those that donated! They were very excited about the fun run day. Each class was announced when they came out to the track. The kids just loved it. I had to work, but Tim was able to take a couple hours off and go out to watch and support them. Theo had such a fun time on his first school field trip to the Pumpkin Patch. He is such a sweet kid. Incredibly sweet. I watched a group of 3 boys, he and two other friends. His teacher took them up to walk through the sunflowers. She followed up about what they were learning in class, pollination. The weather was beautiful as well. We had such a blast!